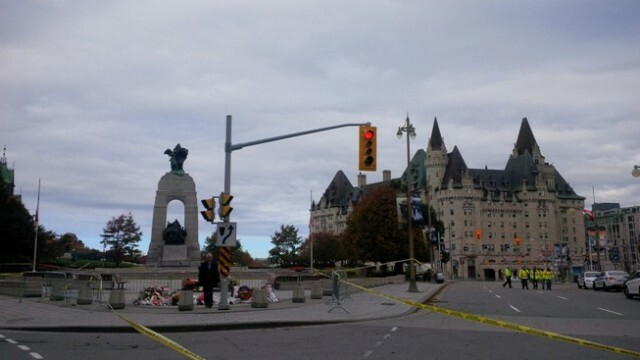 A wide security perimeter around the Parliament buildings in the centre of the Canadian capital Ottawa remained cordoned off with tape and police cruisers last night, hours after a gunman opened fire at the National War Memorial and in the federal Parliament, killing a soldier in uniform. The attacker was shot dead. It was the second attack in three days on Canadian military personnel by domestic suspects, possibly with jihadist motives. Earlier this week, a Canadian soldier died after he was ran over by a car driven by a radicalized man in Quebec. 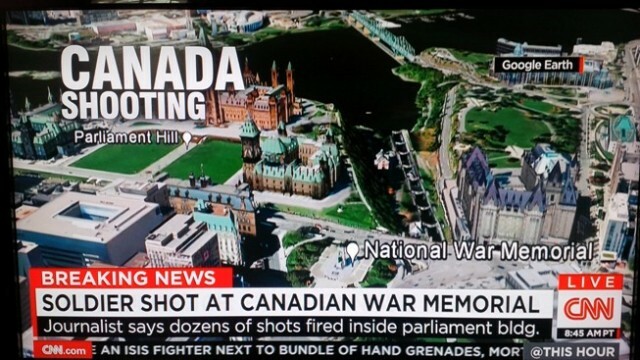 Coverage of the attack in the Canadian capital Ottawa on CNN. The two assaults have shocked Canada, which generally considers itself less prone to violent attacks than the United States. The Canadian government pledged last night to take a tougher stance against domestic terrorists, after the deadly attack paralyzed downtown Ottawa all day. The shootings in the capital took the life of Corporal Nathan Cirillo, a 24-year-old reservist who stood on guard at the National War Memorial. The 32-year-old shooter, a Canadian who has been identified as Michael Zehaf-Bibeau, then rushed to the nearby Parliament, armed with a hunting rifle, and entered the building. Dozens of gunshots were fired in the echoing corridors of Parliament’s Centre Block before Zehaf-Bibeau was shot dead. Three other people were injured in the gun battle. The police, who kept the area under lockdown until late at night, have not yet made any announcements about the gunman’s possible motives. For several hours, the authorities searched for a rumoured second shooter, but it appears there were no accomplices. Although Canada’s domestic terrorism threat level had been raised last week from unlikely to ‘could occur’, police said they had no specific warnings of an imminent attack. Canadian Prime Minister Stephen Harper, who was in the Parliament building at the time of the shooting, linked the attack to Canada’s involvement in the U.S.-led military operation against the Islamic State (IS). Canada is contributing fighter jets and reconnaissance aircraft to that mission, as well as 600 troops. During a televised address to the nation last night, Harper also spoke of the “despicable” attack in conjunction with an assault on two Canadian soldiers “by an ISIL-inspired terrorist” in Quebec on Monday. That attack, in which a radicalized Quebec man ran over two Canadian military personnel in uniform in the town of Saint-Jean-sur-Richelieu, cost the life of 53-year-old Warrant Officer Patrice Vincent. The other soldier was slightly injured. The perpetrator, 25-year-old Martin Couture-Rouleau, was killed by police in a firefight following a high-speed chase. There is no evidence that the two perpetrators knew each other, but there are some similarities between them. Monday’s attacker had converted to Islam, and adhered to jihad online, on Facebook under the name Ahmad Rouleau and on Twitter as Abu Ibrahim AlCanadi. He is said to have been planning to travel to the Middle East, but his passport had been taken away because he was identified as a “high-risk traveller”. Yesterday’s perpetrator, Zehaf-Bibeau, was a Canadian with a Libyan father and a Canadian mother. He reportedly had a record of petty crimes, including drug possession, in Montreal and Vancouver. According to friends, he had been drawn to Islam. The Canadian newspaper The Globe and Mail reported that authorities had prevented him from travelling abroad, possibly by taking away his passport. Canadian intelligence agencies are keeping tabs on at least 90 individuals they suspect of jihadist sympathies. It is expected that security measures and the powers of authorities to track suspects will be strengthened in response to the attacks. Canadian troops have been told not to wear their uniforms in public when they are off-duty. Police presence near the National War Memorial in the Canadian capital Ottawa. 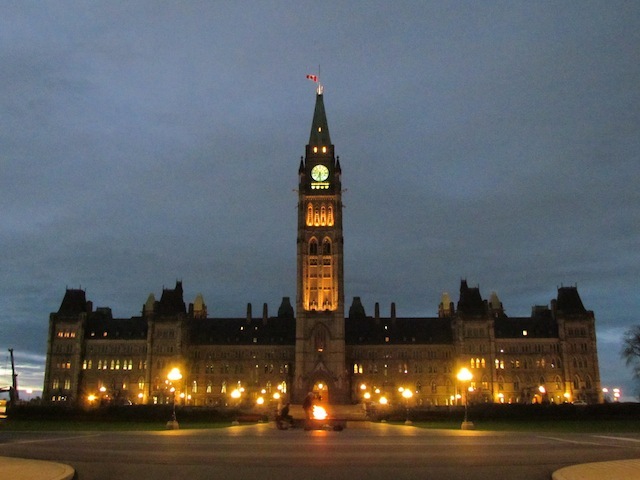 Canada’s federal Parliament in Ottawa, which was entered by a gunman yesterday.